You've heard of "nature versus nurture," and philosophers argue about which is more important. But how does this work on the cellular level? Although genes stay the same throughout the lifespan, genetic code isn't necessarily a person's destiny. In fact, genes can be switched on and off to regulate a number of activities within cells. The body does this naturally in response to internal needs or changes in the external environment, and now scientists are able to switch these processes on and off in the lab. In other words, researchers have created tools that would enable real-time activation of target genes in specific locations in the genome. This technology may help scientists to illuminate the gene function during different biological processes and hopefully be useful in regenerative medicine. Researchers at Texas A&M are creating a system to do this using two common elements: calcium and light. Calcium–capable of far more than building strong bones–plays an important role in this system, as its signals regulate a number of activities within the cell, from growth and metabolism to homeostasis. Yubin Zhou, PhD, associate professor at the Texas A&M Institute of Biosciences and Technology, leads the study developing what he calls the CaRROT system (for calcium-responsive transcriptional reprogramming tool). This system can control the transcription of genes within the body with high precision–in other words, it can dictate how, when and where genes create proteins that perform various cellular functions. CaRROT uses a simple pulse of light or chemicals that can induce the flow of calcium ions into cells. The researchers described their technique in a recent article published in the journal ACS Synthetic Biology. "This technology should allow scientists to turn on or off a diverse array of genes at any location by simply switching the light or adding or withdrawing activating compounds," Zhou said. The researchers designed CaRROT to hijack the calcium signals generated by light (with Opto-CRAC, another technology Zhou and his team developed) to deliver the genome-engineering tool derived from the CRISPR/Cas9 system to turn on genes. "When the light is switched on, the gates controlling calcium ions open to allow the flow of calcium from the external space into the cytoplasm of the cell," said Nhung Nguyen, a graduate student in Zhou's lab who led this work. "This process ultimately turns on the expression of specific genes." The turning on of gene expression then leads to changes in the function of the cell. "We have screened dozens of engineered proteins and undergone numerous rounds of optimization to make the CaRROT system strictly responsive to light," added Lian He, PhD, a graduate student in Zhou's lab and a co-first author of the study. To evaluate how effective CaRROT really is in mammalian cells, the team will test it on genes that control the differentiation of neuron and skeletal muscle. They hope that they can use CaRROT in regenerative medicine to drive the precise differentiation of stem cells into whatever type of organ is required, just by illuminating the cells with light. "The improvement of light penetration in deep tissue gives us the optimism that we could use CaRROT to reprogram cells in damaged organs," said Yun Huang, PhD, a collaborative senior author of the study. "It is possible that one day, by just exposing the tissues to light, we can heal the wound or accelerate the regeneration of injured tissues by photo-tuning coordinated gene expression." In a second study recently published in the journal Angewandte Chemie as a cover story, Zhou and his team invented a new optogenetic tool that can do the opposite trick. With light shining upon cells in the 'excitable' tissues such as the nervous and cardiovascular systems, calcium influx through gateways on the membrane of the cell, called voltage-gated calcium channels, can be turned off. These channels, which constitute the major route of calcium entry into the cell, regulate a series of physiological processes. Because their dysfunction is involved in many diseases, they are considered an important therapeutic target for cardiovascular and neuropsychiatric disorders. Traditional calcium-channel blockers approved by the United States Food and Drug Administration have been widely used to treat cardiovascular disorders including high blood pressure, arrhythmia and coronary artery disease. However, these drugs tend to cause side effects–including headache, edema, dangerously low blood pressure and palpitations–due to their cytotoxicity and off-target effects. "Because of these side effects, generating new interventional approaches to complement the traditional calcium-channel blockers is much needed in the clinic," Zhou said. "Our new optogenetic tool provides a non-conventional method to interrogate physiological and pathophysiological processes medicated by these voltage-gated calcium channels." Zhou and his collaborators combined genetic strategies with optical techniques to engineer a novel class of genetically encoded inhibitors for these voltage-gated calcium channels. "After tremendous efforts of optimization, we developed an ideal photoswitchable inhibitor, which we're calling optoRGK. OptoRGK exhibited excellent light-inducible inhibition of calcium ion entry in excitable cells," said Guolin Ma, PhD, an assistant project scientist in Zhou's lab, who spearheaded the project. The team tested this tool in cardiac muscle cells, which showed rhythmic oscillations of calcium in the dark that matched the heart beating rhythm. "However, upon blue light illumination, the rhythmic oscillations can be substantially reduced or even terminated," Zhou said. "Notably, this process is totally reversible after removal of the light source." With this method, researchers can regulate the activity of excitable cells in the nervous and cardiovascular systems. 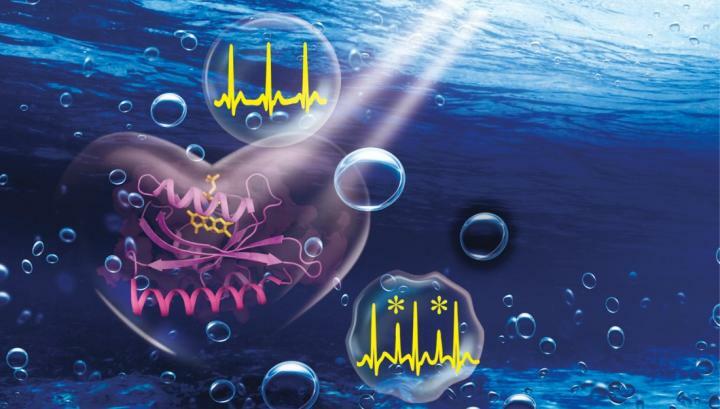 "Complementary to the photoactivatable Opto-CRAC system, the optoRGK toolkit provides a unique opportunity to switch off calcium signals in excitable cells," said Youjun Wang, PhD, a collaborator of this study from Beijing Normal University. "Our novel optogenetic tools can be conveniently applied to control a wide range of physiological processes mediated by voltage-gated calcium channels in multiple biological systems," Zhou added. "While traditional voltage-gated calcium channel blockers lack reversibility, selectivity and tissue-specificity, optoRGK opens exciting opportunities to intervene in related physiological processes with unprecedented precision. We hope that these kinds of studies will eventually lead to new generation of optogenetic devices for curing cancer, cardiovascular and neurological diseases."